Genevieve S. Delaney, 101, of Monroe, passed away Sunday, February 10, 2019, at Ohio Living Mt. Pleasant. She was born in Jefferson, Wisconsin on September 24, 1917, the daughter of Frank and Katherine Schiesl. Genevieve graduated from Jefferson High School as valedictorian and shortly afterwards went to work in Washington, D.C., in a department that today would be part of the Pentagon. She was a member of Holy Family Parish-St. John's Church in Middletown. She was preceded in death by her husband of 64 years, Joseph J. Delaney; son, Patrick J. Delaney of Valparaiso, Indiana; son-in-law, James G. Trimble of Middletown; parents; brothers, Elmer Schiesl and Jim Schiesl; sister, Marion Schicker; brothers-in-law, Robert Schicker, Jim Hensey and John Shipman, all of Wisconsin; and sister-in-law, Annie Schiesl of St. Louis, Missouri. Surviving is her daughter, Peggy Trimble of Middletown. Also surviving are sisters, Germaine Shipman, of Delavan, Wisconsin and Joyce (Duane) Collins, of Kirtland Hills, Ohio; sister-in-law, Gertrude Schiesl of Appleton, Wisconsin; and many nieces and nephews. Mass of Christian Burial will be held Thursday, February 14, 2019 at 11:00 am at Holy Family Parish - St. John's Church, 1405 First Avenue, Middletown with Father Stephen Lattner, OSB as celebrant. Visitation will be prior to the service from 10:00 - 11:00 am at the church. Interment will be at Woodside Cemetery. Memorial donations may be made to the Middletown Arts Center, 130 N. Verity Parkway, Middletown, Ohio 45042. 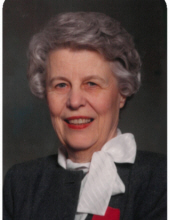 To send flowers or a remembrance gift to the family of Genevieve S. Delaney, please visit our Tribute Store. "Email Address" would like to share the life celebration of Genevieve S. Delaney. Click on the "link" to go to share a favorite memory or leave a condolence message for the family.